10 Again the LORD spoke to Ahaz, saying, 11 Ask a sign of the LORD your God; let it be deep as Sheol or high as heaven. 12 But Ahaz said, I will not ask, and I will not put the LORD to the test. 13 Then Isaiah said: "Hear then, O house of David! Is it too little for you to weary mortals, that you weary my God also? 14 Therefore the Lord himself will give you a sign. Look, the young woman is with child and shall bear a son, and shall name him Immanuel. 15 He shall eat curds and honey by the time he knows how to refuse the evil and choose the good. This passage is unintelligible by itself which is the danger of taking passages out of context. Basically it is in the middle (reinforcement to earlier warnings) of Isaiah warning king Ahaz not to align with the Assyrians. Ahaz seems to be humble not wanting to put God to the test but what he's really saying is that he doesn't want God to give him a sign contrary to his desire to make the alliance. You could relate this to being a kid facing the choice of asking your mom for a cookie when you know the answer will be no, or not asking so that you can do what you want. Isaiah is basically saying, you're not going to ask, but God is going to give you a sign anyway and it will be a son who will be called Immanuel (God is with us). In other words, God will be with your son (or possibly Isaiah's son), but not necessarily with you. 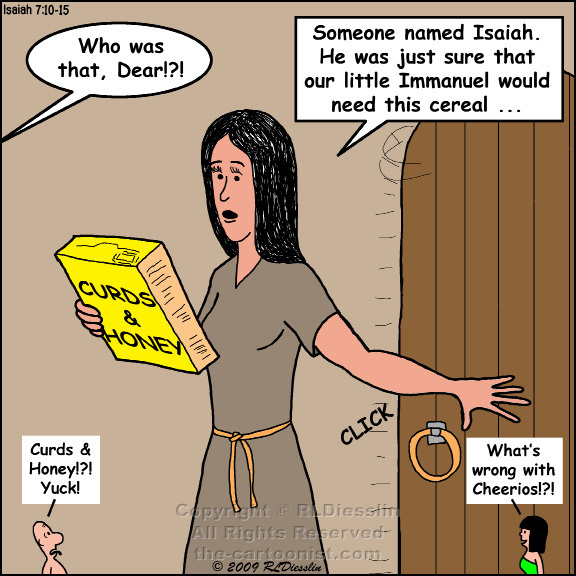 The finer things of life, like curds and honey, will come to Judah under him (and possibly not Ahaz if he doesn't listen to God). At this point Assyria is threatening Israel, and Judah and Israel are also sort of in a civil war. Over time Assyria will conquer Israel, and Judah will become a vassal state paying tribute to Assyria, but for now Isaiah wants Judah to remain independent and not ally with Assyria. Isaiah probably views it as selling out part of their own people even though Israel and Judah are separate kingdoms.